Minions is kind of a critic-proof movie. You pretty much already know what you’re getting from this film: one and a half hours of those walking twinkies from the Despicable Me Movies. Amusing antics! Nonsensical babble! Contrived situations! It feels like a direct-to-DVD movie, but it’ll make a billion dollars. For those who missed Despicable Me and its humongous sequel, the Minions are these little twinkies with faces, arms and legs. Hapless wobbly goofballs, who work for supervillains, specifically Despicable Me’s Gru. After watching the first two movies, I was under the vague impression Gru and his mad doctor sidekick had created the Minions in their evil laboratory, but this new movie invents a whole new overcomplicated backstory for them, going back to the dawn of life on Earth. The bulk of Minions takes place in the 1960s, when the Minions are looking for a new evil mastermind to serve—and they settle on a woman named Scarlet Overkill (voiced by Sandra Bullock), who is a criminal mastermind in a red dress. (Said dress randomly transforms into a rocket or a suit of armor or various other things, as the need arises.) Scarlet’s husband Herb Overkill (Jon Hamm) designs weird gadgets, several of which he gives to the Minions, so they can steal Queen Elizabeth’s crown for Scarlet. 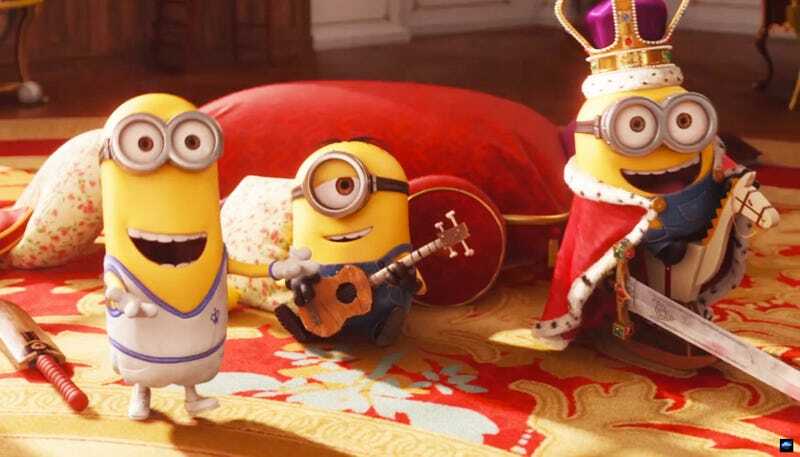 That said, Minions isn’t that funny, and it doesn’t have an interesting enough story to sustain its 90-minute length—it’s basically just a collection of gags, which are mostly cute but also kind of repetitive after a while. The main real source of humor and enjoyment in Minions comes from its non-stop use of slapstick. Those little yellow guys get their Benny Hill on, and then some. There are pratfalls, misuse of common objects, ridiculous disasters, gadgets gone wrong, and so on. Usually, slapstick is about disrupting the usual order of things, by introducing anarchy into a civilized world—but because the Minions inhabit a world that’s already nonsensical, chaotic and infested with supervillians, they paradoxically reintroduce order by creating an even bigger mess. The storyline of the film is about the Minions trying to be evil, but—through their hilarious incompetence and general sweetness—winding up doing good instead. So it’s actually a very pro-order message, even though the film claims to be about celebrating supervillainy. And yet, the fact that insane slapstick is the way the Minions interact with the world still makes them agents of chaos, and the film’s central mechanism of wish fulfillment is just playing to our deep-seated longing to make a ginormous mess. It’s only because the Minions’ (somewhat inexplicable) desire to find someone evil to work for that they end up being agents of good. And the whole notion of “evil” in the context of these films is bound up with comic-book villainy, in a way that’s both self-referential and a bit metatextual—this is a world where comic book villains are not only common, but commonly understood. If you have little kids, they will love this movie, the same way they love all sorts of cartoons about cute things causing a giant mess. You’ll probably get the DVD so they can watch it 10000 times. For adults, this movie offers a few random moments of charming weirdness, and a lot of vaguely subversive chaos and silliness. It’s hard not to feel as though the biggest caper Minions pulls off is being a cash-grabbing followup to a popular series.